I’ve seen this image floating around over the past few days on various social media channels after it was featured during an American Historical Association Session this past weekend in New York City. The session was titled: “Buying and Selling History: Some Perspectives on the Marketplace” and the image was posted by Marla Miller on Twitter. I can’t say there are any surprises. Here is what I see. Some pretty good books on this list. My Holocaust starts off with Larson’s In the Garden of Beasts. It works on so many levels given the focus of the course. 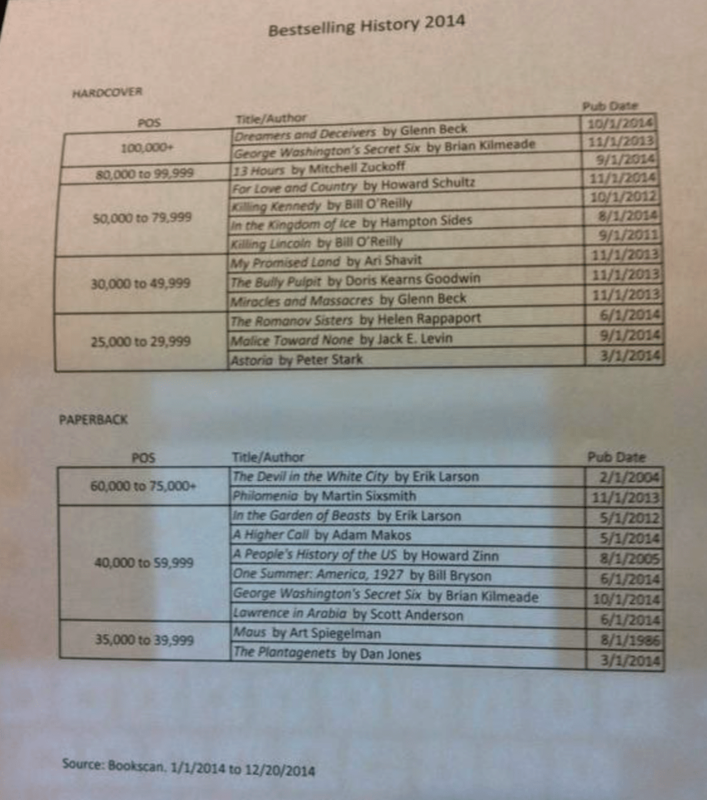 Six of the top Hardcovers were written by men with a Fox News connection. Without Fox we’d be history illiterate. They’ve cultivated large audiences who trust them to deliver history that reaffirms many of the themes of their shows. This is obviously not a list of history books. One cannot place books by Glenn Beck in a non-fiction list. So, then we have to define what is history and who is and who isn’t a historian. I certainly don’t want to play that game. What I find worth considering and taking seriously is that the people who buy these books believe that they are reading history. One lesson I learned as a public librarian was that patrons who came in looking for “history” usually wanted historical fiction, unless they were doing their kids’ homework. We also learned how to wake up drunks, but that’s for a different post. But do you consider any of these to be historical fiction? A few of these titles blur the lines, but I assume most of them purport to be works of history. Not really, I’m just saying that a lot of folks define “history” differently than we do. I agree and I wonder if in this case we are the outsiders. Our understanding of historical explanation goes back to the turn of the twentieth century. Certainly, people read history before that point. I think it comes down to calling a spade a spade. Trash is trash. Real history is written with facts. I may disagree with the interpretation, but at least it is written with facts. Most (I deliberately omit O’Reilly’s Killing series here) of the political spin doctors write to make money off of their audience. What they write is meaningless. Romance novels have more substance and research than the political opinion books. The audience forgets what these shills write about as fast as they read it. How do we know this? Because the shills continue to put out book after book basically saying the same thing over and over again with the same gullible people buying them. That is not history and it is not non-fiction. You may not want to get involved in the definition, and that is certainly your choice, but I do make the choice to be engaged in the discussion. It is a messy engagement, but it is a battle that must be waged if we want real history to be promoted instead of hogwash. I don’t believe that you can so easily write off most of the books listed here so easily. I refer to one author in particular who is not a historian by any stretch of the imagination. Don’t bother looking for his degree because he does not have one. I give Bill O’Reilly credit in that he at least does have a degree in history. Interesting that Howard Zinn remains at the top of this list. That book has to be going on 30 or 40 years old. Of all the histories written in that time frame I’m surprised that A People’s History continues to resonate with a large number of people. Zinn’s narrative is just as empowering as those by O’Reilly and Beck. That’s another aspect that many of these titles embody. I am happy that Brian Kilmeade has become one of our most respected historians. A lot of folks in academia worry that Doris Kearns Goodwin takes readers away from someone like Michael Burlingame. She doesn’t. Popular audiences are not reading him anyway. Her competition is Bill O’Reilly, not Michael Burlingame, in the field of popular Lincoln scholarship. Note to Bloggers: Some of those bestsellers sold fewer than 30,000 books last year. I read Kevin’s article in the Journal of the Civil War Era last month. The book numbers you posted reminded me of it. A lot of academic historians are satisfied if they deal with a topic in their lovingly crafted books, which then sell a thousand or so copies. Kevin encourages them in the article to use social media to reach a broader audience, but many of them ignore his advice. Last year I had nearly 75,000 visits to my Immigrants’ Civil War articles and a facebook community of almost 7,000 people. What if instead of historically accurate info, I was putting up NeoConfederate or Know Nothing clap trap about 1860s immigrants? Would any academic historian working in that field have the reach to counter it? I thoroughly enjoyed Bully Pulpit. Kevin encourages them in the article to use social media to reach a broader audience, but many of them ignore his advice. I do think it is worth pointing out that a number of people on that list have strong social media presences. Whether we like it or not, the ability to grow and maintain an audience is crucial. We live in a voluntary society. No American, after 12th Grade, ever has to study any aspect of history ever again. And many never do. However, tens of millions of Americans are interested in history, but have no academic background in the field. If historians think history is important, I would think that they would want to engage this audience, as you do, through social media. I keep seeing O’Reilly’s books in the non-fiction category and my response always is, seriously? I’m not surprised most are journalists. They are just better writers (I’m thinking Cornelius Ryan and Bruce Catton) and are well versed in who, what, why, where & how. I have never met a journalist who wasn’t interested in history. I don’t believe O’Reilly or Beck write their own books. I was surprised the Devil in the White City was in the No. 1 paperback spot (I read the hardback back in 2004 and recommend it). I am glad Howard Zinn remains popular and I think his book will make this kind of list for a long time to come. I had similar thoughts to Jerry’s about journalists. And I’m pretty sure O’Reilly’s books are co-written (at least from when I glance at the on display at Costco). I’m glad I’ve had professors who are good at encouraging their students to think about the art of writing, and who will assign books by journalists to let us know what people are buying, in contrast to what historians are writing. But I’m also not sure if that will increase sales when we start to publish. My pleasant surprise in the paperback category was Maus, which I’m also not sure is history, but is a must-read. I’ve read the Anderson book on Lawrence of Arabia. He’s a journalist who writes history in the storytelling style of Barbara Tuchman. It’s a good read and gives the reader a decent understanding of what Lawrence and some other well known people, like Aaron Aaronsohn, were doing. It was a Christmas gift to me from my brother last year. McPherson created in his Oxford History, a bestselling and well written history of the Civil War, still worth reading. Good history can and should be well written history. Heaven forbid someone writes history that people actually want to read. The snobbery of academics knows no end. I’m guilty of reading almost all of those on the list. I like to read popular, narrative history just because it’s fun. Not much different from reading historical fiction, really. “Killing Lincoln” was a fun ride, easily as enjoyable as “Abraham Lincoln: Vampire Hunter.” I don’t think it’s wrong for non-historians to write history books, as long as they fact-check their sources very well and get input from actual academic historians. And seriously, go read “Devil in the White City.” Just stop whatever you’re doing and read it. It was one of the best books I read all year. Previous post: “Forever Scarred By Their Service”?